"Bebel" redirects here. For other people with the surname, see Bebel (surname). Ferdinand August Bebel (22 February 1840 – 13 August 1913) was a German socialist politician, writer, and orator. He is best remembered as one of the founders of the Social Democratic Workers' Party of Germany (SDAP) in 1869, which in 1875 merged with the General German Workers' Association into the Socialist Workers' Party of Germany (SAPD). 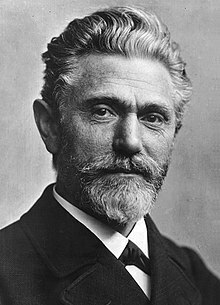 During the repression under the terms of the Anti-Socialist Laws, Bebel became the leading figure of the social democratic movement in Germany and from 1892 until his death served as chairman of the Social Democratic Party of Germany. Ferdinand August Bebel, known to all by his middle name, was born on 22 February 1840, in Deutz, Germany, now a part of Cologne. He was the son of a Prussian noncommissioned officer in the Prussian infantry, initially from Ostrowo in the Province of Posen, and was born in military barracks. As a young man, Bebel apprenticed as a carpenter and joiner in Leipzig. Like most German workmen at that time, he traveled extensively in search of work and he thereby obtained a first-hand knowledge of the difficulties facing the working people of the day. At Salzburg, where he lived for some time, he joined a Roman Catholic workmen's club. When in Tyrol in 1859 he volunteered for service in the war against Italy, but was rejected; and in his own country he was rejected likewise as physically unfit for the army. In 1860 he settled in Leipzig as a master turner, making horn buttons. He joined various labor organizations. Although initially an opponent of socialism, Bebel gradually was won over to socialist ideas through pamphlets of Ferdinand Lassalle, which popularized the ideas of Karl Marx. In 1865 he came under the influence of Wilhelm Liebknecht and was thereafter committed fully to the socialist cause. Following the death of Lassalle, Bebel was among the group of Socialists that refused to follow new party leader Johann Baptist von Schweitzer at the Eisenach Conference of 1867, an action which gave rise to the name "Eisenachers" for this Marxist faction. Together with Liebknecht, he founded the Sächsische Volkspartei ("Saxon People's Party"). Bebel was also President of the Union of German Workers' Associations from 1867 and a member of the First International. Bebel was elected to the North German Reichstag as a member from Saxony in that same year. In 1869 he helped found the Social Democratic Workers' Party of Germany (SDAP), which later merged with another organization in 1875 to form the Socialist Workers' Party of Germany (SAPD), which in turn became the Social Democratic Party of Germany (SPD) in 1890. Bebel's great organizing talent and oratorical power quickly made him one of the leaders of the socialists and their chief spokesman in parliament. He remained a member of the North German Parliament, and later of its counterpart for the German Empire, the Reichstag, until his death, except for the interval of 1881–83. He represented successively the districts of Glauchau-Meerane, Dresden, Strassburg, and Hamburg. Later in his life, he acted as chairman of the SPD. Representing as he did Marxian principles, he was bitterly opposed by certain factions of his party. In 1870 he spoke in parliament against the continuance of the war with France. Bebel and Liebknecht were the only members who did not vote the extraordinary subsidy required for the war with France. Bebel was one of only two socialists elected to the Reichstag in 1871, and he used his position to protest against the annexation of Alsace and Lorraine and to express his full sympathy with the Paris Commune. German Chancellor Otto von Bismarck afterwards said that this speech of Bebel's was a "ray of light" showing him that socialism was an enemy to be fought against and crushed. Falsely accused of being in league with the French and part of a conspiracy to free French prisoners of war held in Germany and to lead them in an attack from the rear, Bebel and Liebknecht were arrested for high treason, but no prosecution was possible for lack of evidence. Not wanting to release such important opponents of the war effort, old charges of preaching dangerous doctrines and plotting against the state were levied against Bebel and Liebknecht in 1872. The pair were convicted and sentenced to two years in Festungshaft [de] (imprisonment in a fortress), which was spent at the famous Königstein Fortress. For insulting the German emperor, Bebel was additionally sentenced to nine months' ordinary imprisonment. This incarceration served to increase Bebel's prestige among his party associates and the sympathetic public at large. In 1874 Bebel took a partner and founded a small button factory, for which he acted as salesman, but in 1889 he gave up his business to devote himself wholly to politics. In 1868 he became connected with the staff of the Volksstaat ("The People's State") at Leipzig, and in 1891 with that of the Vorwärts ("Forward") at Berlin. In party meetings of 1890 and 1891, Bebel's policies were severely attacked, first by the extremists, the "young" Socialists from Berlin, who wished to abandon parliamentary action; against these Bebel won a complete victory. On the other side he was involved in a quarrel with Volmar and his school, who desired to put aside from immediate consideration the complete attainment of the socialist ideal, and proposed that the party should aim at bringing about, not a complete overthrow of society, but a gradual amelioration. This conflict of tendencies continued, and Bebel came to be regarded as the chief exponent of the traditional views of the orthodox Marxist party. Though a strong opponent of militarism, he publicly stated that foreign nations attacking Germany must not expect the help or the neutrality of the Social Democrats. Already in 1911 amid the rising tensions between the European powers, Bebel publicly predicted an upcoming great war with millions of soldiers confronting each other followed by a great collapse, "mass bankruptcy, mass misery, mass unemployment and great famine." In 1899, at the Hanover Congress of the SPD, Bebel delivered a speech condemning Eduard Bernstein's revisionism. His resolution, Attacks on the Fundamental Views and Tactics of the Party, garnered the support of the vast majority of the Congress, including Bernstein's supporters. Bebel particularly distinguished himself by his denunciation of the maltreatment of soldiers by officers and still more frequently by non-commissioned officers. His efforts in this matter had received great encouragement when King Albert of Saxony issued an edict dealing with the maltreatment of soldiers in the Saxon contingent, thus cutting the ground from under the feet of the Imperial Government, which had persistently attempted to deny or to explain away the cases put forward by Bebel. Bebel's book, Women and Socialism was translated into English by Daniel DeLeon of the Socialist Labor Party of America as Women under Socialism. It figured prominently in the Connolly-DeLeon controversy after James Connolly, then a member of the SLP, denounced it as a "quasi-prurient" book that would repel potential recruits to the socialist movement. The book contained an attack on the institution of marriage which identified Bebel with the most extreme forms of socialism. In the preface to DeLeon's translation, 'Woman Under Socialism', DeLeon distanced himself from Bebel on this point, holding that monogamy was the most desirable form of social organisation. 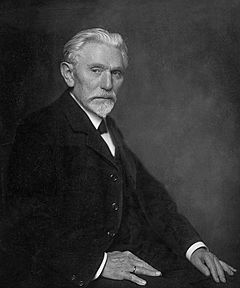 August Bebel died on 13 August 1913 of a heart attack during a visit to a sanatorium in Passugg, Switzerland. He was 73 years old at the time of his death. His body was buried in Zürich. At the time of his death Bebel was eulogized by Russian Marxist leader Vladimir Lenin as a "model workers' leader," who had proven himself able to "break his own road" from being an ordinary worker into becoming a political leader in the struggle for a "better social system." The well-known saying "Anti-Semitism is the socialism of fools" ("Der Antisemitismus ist der Sozialismus der dummen Kerle") is frequently attributed to Bebel, but probably originated with the Austrian democrat Ferdinand Kronawetter; it was in general use among German Social Democrats by the 1890s. Bebel, along with Karl Marx, Friedrich Engels and Ferdinand Lassalle, was among the socialist icons included in bas relief portraits on the facade of The Forward building, erected in 1912 as the headquarters of the New York Yiddish-language socialist newspaper. Women in the Past, Present, and Future. London: Reeves, 1885. US Edition: San Francisco: G. Benham, 1897. Assassinations and Socialism: From a Speech by August Bebel, Delivered at Berlin, November 2, 1898. New York: New York Labor News Co., n.d. [c. 1899]. Beber. New York: International Publishers, 1901. Socialism and the German Kaiser: Two Speeches. With Georg Heinrich von Vollmar. London: Clarion Press, 1903. Women Under Socialism. New York: New York Labor News Co., 1904. New translation: Women and Socialism. New York: Socialist Literature Co., 1910. Trade Unions and Political Parties. Milwaukee: Social-Democratic Publishing Co., 1906. Bebel's Reminiscences. New York: Socialist Literature Co., 1911. The Intellectual Ability of Women. New York: Cooperative Press, n.d. [c. 1912]. My Life. London: T. Fisher Unwin, 1912. Speeches of August Bebel. New York: International Publishers, 1928. ^ a b c d e Rines, George Edwin, ed. (1920). "Bebel, Ferdinand August" . Encyclopedia Americana. ^ a b c d e f g "August Bebel, German Socialist Leader, Dies in Switzerland," The Weekly People [New York], vol. 23, no. 21 (23 August 1913), pp. 1–2. ^ a b Reynolds, Francis J., ed. (1921). "Bebel, Ferdinand August" . Collier's New Encyclopedia. New York: P.F. Collier & Son Company. ^ Vladimir Lenin, "August Bebel," Severnaia Pravada, 6 August 1913. Reprinted in Vladimir Lenin, Collected Works: Volume 19. Moscow: Progress Publishers, 1963; p. 297. ^ Andrei Pozdnyakov, "August Bebel," Karl Marx, Frederick Engels Collected Works: Volume 44. New York: International Publishers, 1989; p. 684. ^ a b c d e f Chisholm, Hugh, ed. (1911). "Bebel, Ferdinand August" . Encyclopædia Britannica (11th ed.). Cambridge University Press. ^ a b c Gilman, D. C.; Peck, H. T.; Colby, F. M., eds. (1905). "Bebel, Ferdinand August" . New International Encyclopedia (1st ed.). New York: Dodd, Mead. ^ Krumeich, Gerd (2013). "Das Nahen des Weltkriegs" [The Dawning of the World War]. Damals (in German). Vol. Special volume. pp. 7–22. ^ Vladimir Lenin (1902). "What Is To Be Done? — I. Dogmatism And "Freedom of Criticism"". Marxists Internet Archive. ^ Chisholm, Hugh, ed. (1922). "Bebel, Ferdinand August" . Encyclopædia Britannica (12th ed.). London & New York. ^ Mombaurer, Annika "Wilhelm II, Waldersee, and the Boxer Rebellion" pages 91–118 from The Kaiser edited by Annika Mombaurer, Cambridge: Cambridge University Press, 2003 page 97. ^ a b Deas, Andrew (April 2009). Germany's Introspective Wars. Colonial and Domestic Conflict in the German Press. Discourse on Race. 1904–1907 (MA thesis). Brandeis University. p. 45. Retrieved 2 May 2014. ^ Smith, Helmut Walser; ‘The Talk of Genocide’, the Rhetoric of Miscegenation: Notes on Debates in the German Reichstag Concerning Southwest Africa, 1904–1914, in The Imperialist Imagination: German Colonialism and its Legacy, (Sara Friedrichsmeyer etc. eds. 1998), p 107–23, 116, 111–12 & 118. ^ Vladimir Lenin, "August Bebel," Collected Works: Vol. 19, pp. 300–301. ^ Richard J. Evans, The Coming of the Third Reich (Penguin Group, 2005: ISBN 0-14-303469-3), p. 496. Biography of August Bebel. Retrieved 31 May 2007. August Bebel Internet Archive, Marxists Internet Archive, www.marxists.org/ Retrieved 31 August 2010. "Bebel, Ferdinand August" . The New Student's Reference Work . 1914. Ulrich Rippert: August Bebel and the political awakening of the working class, wsws.org Retrieved 28 August 2013. This page is based on the Wikipedia article August Bebel; it is used under the Creative Commons Attribution-ShareAlike 3.0 Unported License (CC-BY-SA). You may redistribute it, verbatim or modified, providing that you comply with the terms of the CC-BY-SA.